The Ammonite is an extremely well known fossil, almost everyone recognises the unusual twisted curves of this ancient animal. They are typically sold rough, as they are found, or cut and polished as a display piece. 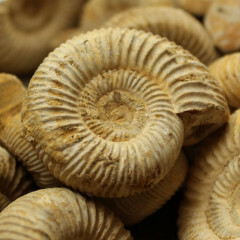 Information about the Ammonite fossil. 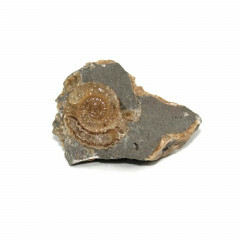 Time travel about 140 million years with the distinctive spiral of this interesting fossil. They are perhaps the most well known fossil, possibly due to how easy then are to recognise. A signature curved spiral shape makes identification very easy, assuming the specimen is intact enough to be recognisable. 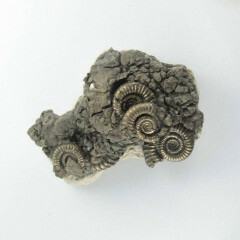 Reverse impressions of these fossils are sold sometimes, too – where the fossil has been removed from rock or clay, it leaves an imprint, which can be quite attractive if it has not crumbled. 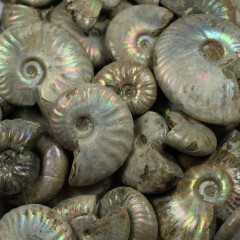 In some rare circumstances, these fossils can be iridescent – this effect varies drastically. Some have very small patches of low quality colour – some have tremendous patches of beautiful rainbow iridescence, which can rival Australian or Welo Opal in its beauty. 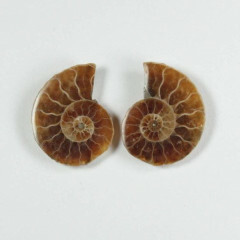 This gemstone grade of Iridescent Ammonite is known as ‘Ammolite’. 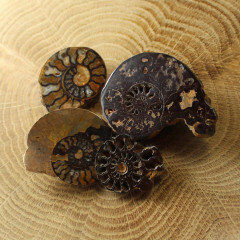 Spirituality and Crystal Healing with the Ammonite fossil. 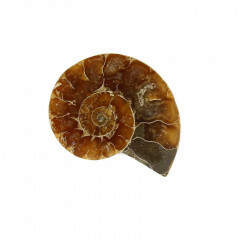 In medieval Europe, fossilised ammonites were thought to be petrified coiledsnakes, and were called “snakestones” or “serpentstones” in medieval England. 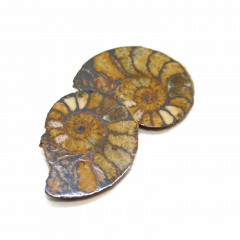 Hindus believe ammonites to be a concrete manifestation of Vishnu. They have a strong connection to the Earth and create a symbolic union between mineral and animal kingdoms. Traditionally used as a charm for virility, they can also be used for cleansing dense energies that are filtered through the spirals and released as fresh, positive energy. They are associated with the Third Eye chakra.